On the 30th March 2011, 11 weeks before his due date and weighing 820grams (1lb 13ozs), Samuel made a dramatic entry into the world. Two days earlier during a routine scan, the team discovered that Samuel was not growing and probably hadn’t done so for two to three weeks due to an absent end-diastolic flow. I was immediately transferred to Heartlands hospital in Birmingham where they promptly diagnosed that I was suffering from Pre-eclampsia. Following a forty-five minute emergency caesarean section operation performed by an eighteen person medical team, Samuel let out a small cry as he was delivered and was ready for the fight that lay ahead. He was soon whisked away to the neonatal unit where he would take residence for sixty-eight days. Samuel was extremely strong, having been placed initially on CPAP to support his breathing as a precautionary measure, he was breathing by himself within twenty-four hours. My condition however, got progressively worse, being diagnosed with HELLP syndrome, my liver was failing and my blood was not clotting properly. After 24 hours, my condition thankfully stabilised and once able to prove to the midwives that I could get out of bed unaided, I was allowed to go and see Samuel. He appeared so fragile, his body covered in many wires and tubes. The nurses carefully took Samuel out of the incubator and placed him on my chest for some Kangaroo Care (Skin to skin contact). This was to become a daily routine. We were warned that a premature baby’s journey in Neonatal was akin to a rollercoaster. 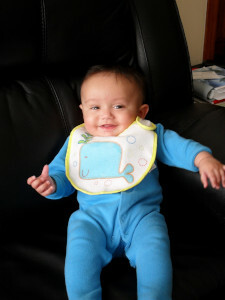 During the first week Samuel did not tolerate breastmilk and had bile in his stomach. He was required to remain on Total Parental Nutrition (TPN) in which essential food is fed through long lines into a child’s body. Two weeks after his birth, Samuel started to tolerate milk and the Doctors decided that they would remove Samuels TPN. Something was not right, I could see Samuels heart rate increasing and his temperature rising on the monitors. Then Samuels apnoea monitor sounded an alarm, Samuel stopped breathing. The neonatal nurse gently rubbed his back and he started to breathe again. However, Samuel stopped breathing again moments later, and having suspected an infection being caused from the TPN line, the nurse had already summoned the doctor to assess Samuel and address his condition. The Doctors and nurses immediately placed Samuel back on to CPAP together with a course of antibiotics in order to fight the infection. Samuel needed to gain weight, this would be a slow process and had always commented upon by doctors during their rounds. Whilst in the incubator, Samuel was fed breast milk which had been fortified. His weight soon increased, but once he weighed enough for a cot his milk was no longer fortified. Unfortunately whilst in the cot Samuel actually lost weight and the hospital assigned a dietician who decided that Samuel should consume High Energy SMA. Samuel began increasing in weight with this new milk and was finally discharged from the hospital. Whilst at home, Samuel continued with High Energy SMA. Although not a great feeder and being sick often, Samuel did put weight on, finally achieving the 25th Centile. Weaning Samuel was difficult and it was during this period we discovered he has quite a strong gag reflux. He would often be sick, even on pureed foods. We had to ensure Samuel consumed the correct quantity of food so as to not be sick. Nappy bags soon became a great form of sick bag (and we still carry them around today! ), sick bowls would be placed in several locations around the house in case of an emergency. Samuel’s Neonatal consultant closely monitored him, even though he was increasing in weight (albeit it very gradually), his height was not increasing. We had always been informed that ‘catch up’ growth would probably happen in the first two years. Samuel never caught up with his peers. At eighteen months old, Samuel was no longer taking high energy SMA and instead he was given Fortini supplements. This continued to make Samuel sick so we took the decision to stop the supplements. Samuel still had support from the dietician until the age of three, but as Samuel was at least eating regular meals, the dieticians felt there was nothing further they could do. When Samuel was younger he struggled to fight off infections. When returning home from my first ‘back to work’ day, I noticed that Samuel was struggling to breathe and I took him straight to the GP’s who advised to take him straight to A&E if his condition worsened. That night was spent in A&E (a winter was never a winter without a trip to A&E). At three years of age, the Neonatal Consultant referred Samuel to the Endocrinology team at Birmingham Children’s Hospital. We were really hoping that Samuel would be discharged from his care (by this time all of the other children who I had met while Samuel had been in hospital had been discharged). We never really questioned Samuel’s growth before this, we knew he was smaller but there were some possible explanations. Firstly, Samuel was born prematurely, secondly, both sets of grandparents are not particularly tall and thirdly we actually believed that he would ‘catch up’, he just needed time. Samuel’s initial Endocrinology appointment was fine, a decision was taken to measure his height accurately for 6 months so that the consultant could monitor him on a height velocity chart to understand his growth rate. During the next appointment, I felt Samuel had grown by less than one inch in 6 months. His health hadn’t been particularly great over the winter period. We discussed the next steps with the consultant and had to take the decision whether to start testing for growth hormone deficiency now or in 6 months times. We made the decision to start the testing right away. The Stim test concluded that Samuel was growth hormone deficient, so a second test was arranged, the arginine test. The results of the second tests resulted in Samuel being diagnosed as being growth hormone deficient. 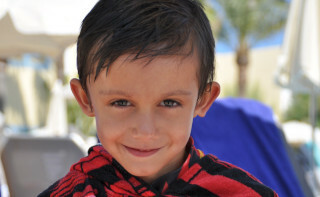 On the 31st July 2015 Samuel had been injected with his first dose of growth hormone. The decision for growth hormone centred on wanting to give Samuel an opportunity and if this did not work then we could be satisfied that this avenue has at least been explored. The first three days were tough with many tears and tantrums. Honesty has been the best policy with Samuel by explaining to him why he requires growth hormone. Samuel is fantastic with the injections, taking all in his stride without a single complaint. An MRI scan arranged by the Endocrine team discovered that Samuel has a small pituitary gland. Samuel has now managed to be recorded on a growth line, he floats around the 9th centile. Samuel’s health has dramatically improved, no sudden trips to A&E (touchwood) and no need for the frequent use of inhalers. Samuel still struggles to gain weight, we managed to get a referral back to a dietician and he was put on fortini milkshakes for 8/9 months. 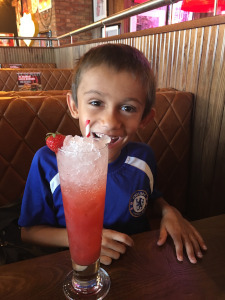 He was encouraged to have them in the afternoon at school, I’m unsure whether he drank much but by having it at school made him feel different. His friends didn’t have them, and he felt like the odd one out. He didn’t put on any ‘extra’ weight by having the milkshakes so we made the decision to stop them. We want to encourage Samuel to eat and take as long as he needs to finish his food. The boy does eat! He eats a lot yet only puts on 4/5 pounds a year. 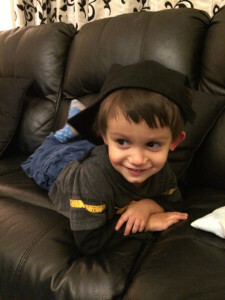 Samuel is under genetics, after a long wait they ruled out a genetic diagnosis for RSS. The geneticist thought the best route for him was to enrolled him on to the 100,000 Genomes project. We’ve been on the project since March 2017 but with no results as of yet. Since starting growth hormone, Samuel’s energy levels have increased. He does football, kickboxing and swimming (although he is a little nervous in the water). Kickboxing has been amazing for him, he was introduced to it at school and now goes 2/3 times a week. It has helped him build up muscle tone, stamina, balance and focus. The instructors have been really supportive, and Samuel is now on his 4th belt. Samuel has a real passion for football, he has only recently starting playing and absolutely adores it. He has lessons once a week and has been ‘man of the match’ on various occasions. Samuel really looks up to Lionel Messi, he is an amazing role model for him. I’ve heard Samuel tell his friends that he is just like Messi due to his injections. I’ve never heard Samuel talk about his injections before which is a real positive step forward. Samuel is now Seven years old and although he is currently diagnosed as being Growth Hormone Deficient, he is never disheartened and never gives up. A truly courageous and special little boy.